A current debate about higher education seems actually to be an old one: practical science training vs. general education in the liberal arts. The contrast persists in the public mind even though the sciences are part of the liberal arts, and even though the best science education usually includes the arts and humanities. Two heavyweights, Bill Gates and Steve Jobs, have recently been said to embody the contrast. The Microsoft founder has called for a targeted investment in the sciences and engineering, while the Apple CEO has talked about the importance of the arts, humanities, and design for the success of his company. So what is education, PC or Mac? I would hope that our leaders in government, industry, and academia would realize that, although they may have to decide on an operating system, they don’t have to make a choice between the sciences and the rest of the liberal arts. Indeed, the sciences are a vital part of the liberal arts. The key to our success in the future will be an integrative education that doesn’t isolate the sciences from other parts of the curriculum, and that doesn’t shield the so-called creative and interpretive fields from a vigorous understanding of the problems being addressed by scientists. For example, at liberal arts schools across the country there has been an increase in interest in the sciences from students who are also interested in history, political science, literature, and the arts. 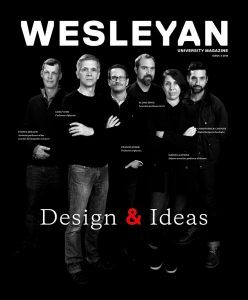 Here at Wesleyan, Neuroscience and Behavior is among our fastest growing majors, alongside of Science in Society, and programs linking the sciences, arts, and humanities have been areas of intense creative work. This semester we hosted a conference in the young field of Animal Studies, and throughout the year one can find productive collaborations among social scientists, artists and biologists, dancers and physicists, and filmmakers and biochemists. These teams form not because the members are trying to be fashionably interdisciplinary. They come together to address specific problems or in pursuit of particular opportunities. What can we learn from the recent contrast of two of our country’s business-technology giants? Perhaps it’s that education should be looked at not as a product that you use to increase your income in that all-important first job but as a platform from which you will generate some of the most important features of your life. If you believed that education was a product, then it might make sense to make it as narrowly instrumental as possible. It might make sense to call for a tapering of the range of skills taught (to STEM fields, for example) to maximize your return on investment. If education is a product you are buying, why pay for things you really won’t need? But if education is a platform, then it should be thought of as an intermediary, a capacity builder that leads to many more things than at any one moment you could possibly know would be useful. When you see education as a platform, you see it as something that generates further curiosity, new needs, experiences to meet those needs, more curiosity, and so on. Education isn’t just an object that you use to get started in a career; education is a catalytic resource that continues to energize and shape your life. Education enhances your ability to develop new skills and capacities for connectivity that allow you to solve problems and seize opportunities. Successful education is a platform of lifelong learning from which new possibilities are created, and that works for both PCs and Macs. I hope that our leaders in government, industry, and academia will realize that innovation in technology companies, automobile design, medicine, or food production will not come only from isolated work in technical disciplines. I also trust that our humanists and social scientists will continue to educate students who are ready to work with scientists, engineers, and designers to more fully understand the history of the present and our prospects for the future. A pragmatic, broadly based education that encourages bold inquiry and regular self-reflection recognizes the increasingly porous borders among disciplines and departments. At Wesleyan the vitality of problems-oriented, multidisciplinary research and teaching invigorates our campus culture in ways that enable our graduates to have a positive impact on society “far out of proportion to our numbers.” That impact depends on bold and rigorous interconnections among the sciences, humanities, arts, and social sciences.